Okay…. I had a bit of time last night and today, so I have decided to put this part into use, get a few photos, and tell you all about what it is and why I think it is special, before I went away to Charleville. About a month and a half ago a Remington Noiseless arrived at my place in a pretty awful state. While the typebars moved nicely, the spacebar was frozen. The drive band was cut in half (yes, cut – not snapped) and a key was missing. Worse, the carriage lever was but a mere stub – a fraction of its useful self, with a piece of electrical tape surrounding the end of the stub; a futile attempt to try and hold the thing together. The broken part of the carriage return lever was no-where to be seen. As was the missing ‘Margin release’ button. This machine has potential. I weighed up the possibility of the Noiseless becoming just a shelf based poser, and decided that I didn’t want to start a trend. Especially as at the time, I wasn’t confident that I could repair the Valentine that I was also sitting next to my desk. I thought about welding a metal piece to the stub, and grinding it down so it looked nice. I also considered just getting some local engineer friend to knock one up. But I decided against that, as I should have been able to do that myself – if I had the tools. Late last year I read an article about 3D printing, and how a company called ‘Shapeways‘ were even offering to make stainless steel prints. I recalled this when I was thinking about rebuilding this lever, and thought about designing something that I could slip over the end of the stub, and adhere it into place. Again, I wasn’t happy about the possible durability of such a design, so I boldly decided to design the component from scratch. I checked over the materials data, and felt the most confident with the more expensive, but closer to specification, stainless steel – instead of the hard wearing ADF. I actually have formal training in CADD, and have used such tools in my younger – lets make my own hardware – years. But I really couldn’t be stuffed going into a complicated and expensive CADD tool to design something which largely was a free flowing shape that only attached at a crucial ‘head point’. So I delved into a simpler to use tool that is free to access on the internet – called ‘Google Sketchup’. I brought out the micrometer and measured the heck out the the stub and head point, and then analysed the functionality of the design. I measured up sections and did a bit of thinking about it, and laid out some preliminary designs in Sketchup. One of the things I love about the Noiseless, is its very Art Deco inspired design. I have decorated my place with a lot of Deco furnishings, and I loved the idea of a Noiseless, and beautifully Deco typewriter. 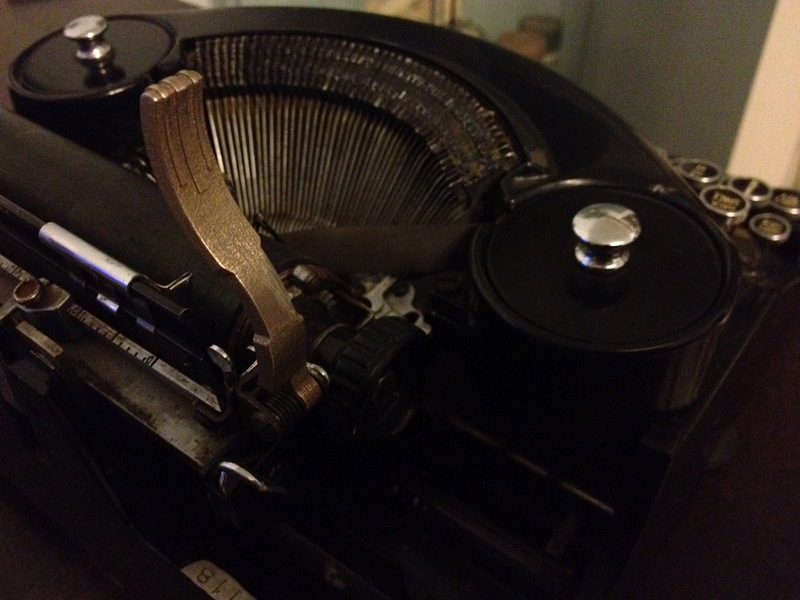 So I decided I would give this lever the bold deco stylings the I believed that the typewriter needed. I also started making plans about how to repaint and re-finish the whole – somewhat damaged, machine into a beautiful deco piece of writing machinery. By version V3 of my design (technically version 4), I had most of the style cues in place, and the design largely structured how I wanted. But I had messed up some dimensions, and as such everything was – well, giant sized and out of proportion. I rushed a V4 design at the last minute and loaded it up into the printer’s software. The printer doesn’t guarantee tight tolerance observation, advertising that they work to tolerances of 0.2mm. They also require structural thicknesses of a certain size, so it doesn’t collapse after printing. The material technically isn’t stainless steel. But it is pretty close to it. When it is produced by the printer, it comes out in a very fragile form, and needs to be ‘cured’; heated to a high temperature so it fuses togeather. As such, I was quite worried as to the strength of the outputted component – so this was really only going to be a prototype. I shouldn’t have worried. The piece arrived yesterday in a bubble wrapped bag inside a rigid cardboard envelope. The piece weighed surprising heavy, and in my hand felt substantial. I tried connecting the pieces together to make the carriage return, but nothing would slide into the centre hole of the piece. The whole design was about 0.1mm smaller than size, but the centre hole was about 0.15 off dimensions. But I expected this. The post that slots into the centre of the head was exactly 4mm wide, and so I was happy to use a 4mm drill to bring it back up to size. I had a 4mm bit on hand already, as I had expected to have to revise the size of the hole anyway. It was then that I discovered how hard and tough this steel was. I managed to drill about 2mm into it before my cheap 4mm drill was blunted. The vice couldn’t crack the piece, and at one point I sent the bit sailing across the room at high speed, while I tried to ream the inside of the hole out. I have no doubt what so ever that this unit is tough. 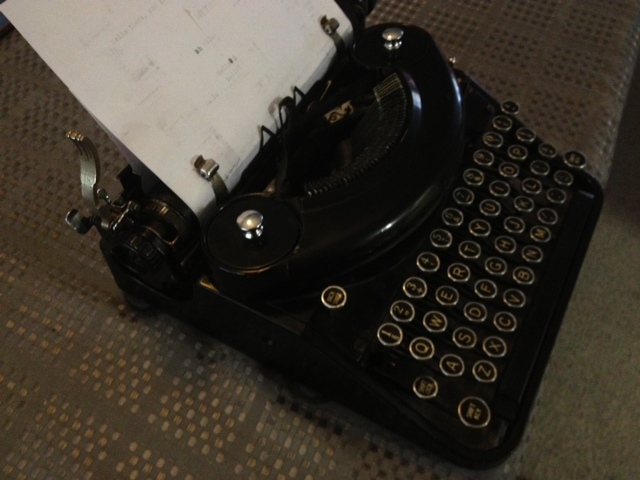 I slotted the piece into the typewriter after that, and it worked perfectly. I need to make a couple of small changes to the design for future use, but largely I am very happy with the result. The detail on this design is finer than what already exists on this typewriter. I think the whole writer needs more work. 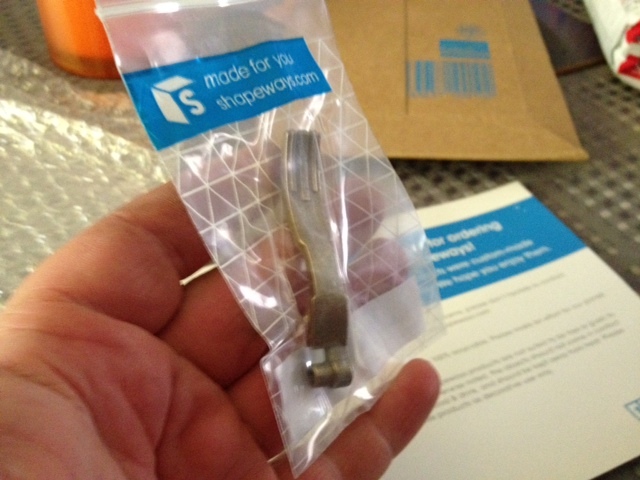 Shapeways provide you with the facility to create an online shop on their site. As such, I have listed this component up in my own (still work in development) shop. This part really isn’t ready for use yet, as I learned a couple of things last night when I tried to use it, that will all me to refine it down, but it does offer a glimpse as to what is possible. I also designed up some rubber feet to replace my Adler Gabriele’s feet. They are on sale there now too. Shapeways have just started producing a rubber like material to use. At this point I realised, a lot is possible. I’m currently designing a replacement platen knob for the Hermes 3000, based on the two different model 3000’s that I have. The end result will still need to have a drill and tap set taken to it to put a thread in the hole, but essentially you will be able to print out your own H3000 knob. I imagine that it is possible that we could be able to create large libraries of difficult to replace components for our typers. Further more, I’d be confident enough to say that the strength of the metal components produced, would allow us to produce things like – replacement type stubs. Want to put Vogue/Moderne Pica typeface on your Hermes 3000? It is plausible. As well as the sintering technology that has been used here, there are also other rapid prototype production methods out there that can produce metal, plastic, stone, ceramic and rubber parts with finer tolerances, that machine them out of specific raw materials. Building up a library of models, designs and components can guarantee that we can continue to use and repair these typewriters – long after the current computer technology has been broken up and recycled. It just depends on how people wish to use this technology. Make computers work for your typewriter? Absolutely. This kind of technology will only get better in the future. The online shop allows andyone to produce the printed piece at your own cost, and it pays a tariff to the person who designed it. As it stands, I’ve put a $3.50 tariff on the lever, and a 0.50c one on the Adler rubber feet. I thought this was fair, as I spent some hours revising these designs. Both of these designs are immediately usable, but give me a little while longer to revise this lever. I believe this lever may be usable on a variety of older Remington portable models. Know your software: When laying out the design I entered in diameters as radiuses. Sketchup uses this as default, and doesn’t really move on from that. I almost printed this with an 8mm wide hole. Think about finish: I fiddled with the settings on the Shapeways site when I put the design in, and left the ‘Antique bronze’ finish still switched on. As such, I got that finish, and got charged for it. Instead, I should have had them grind the finish down smooth. They ground a section of it – probably to remove a working tag – and it looks smooth and polished, while the surface of the lever for the most part has its default pitted – post print surface. But you can grind and sand the finish afterwards anyway, so don’t worry too much about this. Consider shrinkage: Shrinking is consistent feature of something that is cured, and has predictable results. look at the forums on Shapeways. Think about your materials: There’s other options than stainless steel. I should have prototyped in a much cheaper ADF, but I wanted to evaluate hardness and toughness of the metals produced, so I went for the expensive stainless steel. Incidentally, there’s more expensive materials – like sterling silver. This is only the start of what I’m going to do to this Noiseless, and it still needs a heck of a lot of work yet. It’ll end up costing me, but I’m learning a lot in the process, so I think it is invaluable. Stay tuned to see the end result. Un-shrunken image (click to view) so you can see the partially polished section. ← Rushed post – Coming attractions! Too early to think properly still. That is very nice! I had no idea #D printing had migrated to metals, but I should not be surprised. I knew that nano devices and circuits were being made through sputtering techniques. I'm glad you found this resource and shared the process and results. One bonus with Google Sketchup: the drawings can be pulled directly into the Makerbot Thingiverse in case you want to play with PLA or ABS plastic. The future is now! Thank you for pioneering this. It's going to be huge for collectors of all sorts of obsolete machinery, I can see it now. We only need one person to design a piece properly and then the rest of us can buy it. (I've got to ask, what is the cost for this piece?) This particular piece often breaks on RNP's, so there is a market for it. OK, I just found the item on Shapeways. (Link) Prices seem perfectly reasonable. Printing the metals was a new development. But there had been rapid machining machines around for years. They are a little harder to operate than the printers though. Yeah, I had a feeling that they did break often. I looked at a few other examples, and realised it wasn't very well designed. I looked at the location it broke, and why it broke, and I feel pretty confident that my design will endure for longer. However, my design at the moment comes quite close to another component that would have been safe from contact in the past. I feel replicating parts should be fairly easy. It is redesigned parts that will bring more unexpected results. I've still got a lot to learn yet. 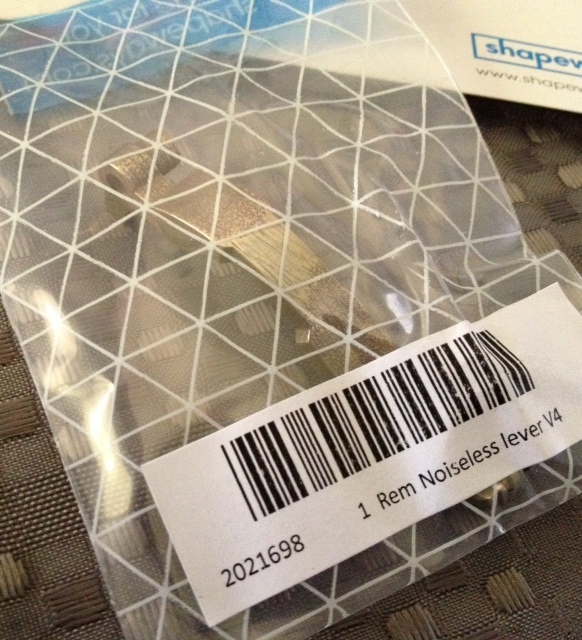 But… I think I have made the first brand new RNP part in maybe…. 40 years? That's the one. I'll be revising that possibly in the next couple of weeks, and should have a model that is ready for everyone to use soon. I might be able to even produce a couple of other designs, so that people have something to pick from. 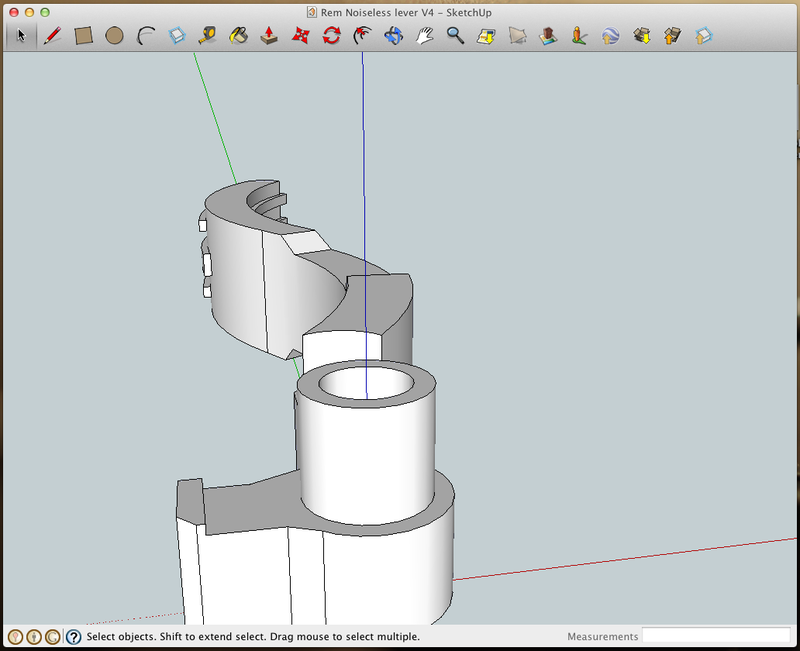 Google sketchup is pretty cool that way, and I might have to look a bit closer at Makerbot soon. PLA will be good for future cheaper prototypes. Sketchup is very limited though, and eventually I'll probably have to use some serious CADD software for designs. For example: Sketchup doesn't allow for 'lathed' shapes, which would allow me to produce complex round shapes – like knobs and shafts, with ease. Outstanding. I've put this up on the Typosphere site. I would say 62 years. Remington still made noiseless portables in the late '40s but dropped them when they came out with the new design that became the Quiet-Riter around 1950. I can't begin to express how cool this is. Especially for collectors but even the non-typosphere practical uses of the technology. Thank you for leading us down this path! Good god! I should have guessed it was a vertical carriage return bar. This is quite an amazing find. I cannot wait until more people start to make use of this, giving all of us a vast array of newly machined pieces for our ancient typers. Thanks for bringing this to our attention. 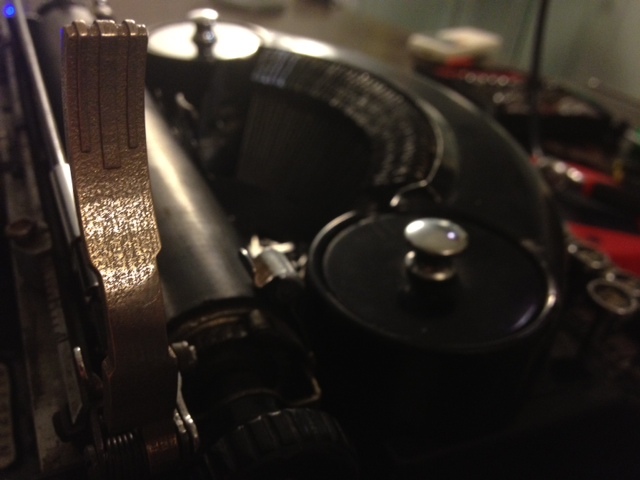 You are at the forefront of a new age in typewriter repair. You might take a look at Autodesk 123D. It is a popular freeware option in the Makerbot community. Take a look at all of the stuff at http://www.thingiverse.com. There are many bizarre and worthless bits of junk, but also plenty of mechanical things. Makerbot doesn't have the exact shade of Hermes green, but they do have PLA that is pretty close and a glow in the dark ABS option. How cool is that? If you have a local hacker/maker space, they will have multiple printers. There are people that do piece work as well. I've been trying to match that Hermes green for a bit now, with just paint. I need to get hold of a pantone book so I can compare it. However, the keys are a different shade of green to the rest of the typer, and I think the green of the keys will be easier to match. Platen knobs of this colour wouldn't look out of place, and actually would keep with a 'contact point' colour theme. Oh damn! Now I have to correct my spelling, and rushed sentences. Photo photos? GAH! I meant… few photos. How any of you read this is beyond me. Well, all I did was see the potential implications. Eventually someone on here will know someone with an NC Water-cutter, grinder and a few other tools, and we'll be in a position to actually make new parts in a variety of ways. Once people start building up a library of parts, we'll be set. Thank you… I didn't do exactly that much, other than figure out the implications – and some ways of being able to use this stuff. I've been very entertained by the reality of temporary and quickly outdated pieces of technology, being used to support and repair the more durable and enduring technology that the new technology was supposed to have completely replaced. Actually, I think the biggest thing I have done here is to show that computers are only a piece of some kind of output tool, while typewriters are the enduring tools for writing. I'm jealous of all such talented persons as yourself who are able to do this kind of craftsmanship. Even though I could conceptually design such a thing, I don't know how to use 3D CAD programs, though it might be worth learning just to take advantage of the current 3D printing technology. My hats off to you. That is going to be one wonderful Noiseless when you're finished with it. Heh. 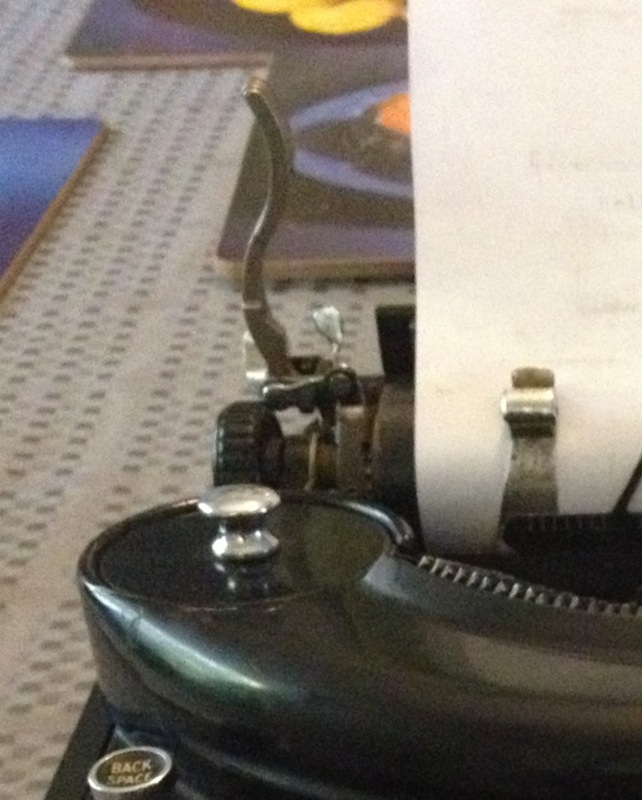 Typos are expected in a typewriter-related web site. That video made the rounds some time back. It was someone's senior project in college. I can't speak to how accurate it is, and I'm sure there's a few hundred tiny pieces missing, but they've got the general structure set up, and obviously worked out the linkages enough to simulate typing. Given the dodgy tolerances of current 3-D printing, I wonder if it would be more feasible to try to reproduce some of the earlier machines? Those without the super-fine mechanical tolerances. It would be interesting, say, to see if the Writing Ball could be reproduced, or if a modern equivalent could be made, taking into account the imprecision of printing technology right now, and using off-the-shelf parts for components that can't be printed yet, like springs. It turns out there are services now that will create a 3D model from a series of digital stills or a video, such as hypr3d.com. In theory, one does not need to know CAD, one just needs to snap some pictures. You get a digital model (free) and you can then have it printed. Whether the process is precise enough to reproduce machine parts, I don't know, but this is pretty exciting. It's amazing! I read it yesterday and I could not believe it! Good work! So today I picked up an Underwood Noiseless, which I think was actually *made* by Remington, and got it all the way back to my desk before I realized it was missing a return lever. I remembered your post and even made mention of it in my blog entry about the find, but only now realize that it's the same damn part. 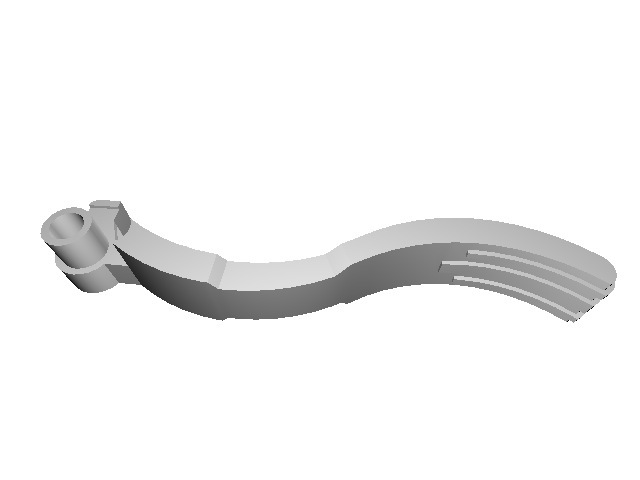 I may need to pick your brain for details, and in the meantime… off to Shapeways! Scott, I'm interested in someone designing and uploading the cycle clutch gear for Selectrics. Since you have experience with this, would you be interested in giving it a try? The metal hub needs to be removed from the cracked gear and pressed into the new gear. Here's a picture of the part.